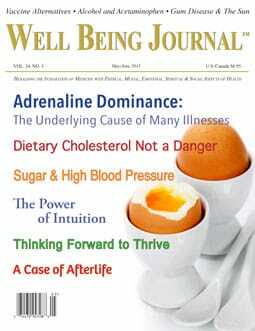 Researchers Find Dietary Cholesterol Not a Danger. Bruce Fife, N.D., writes about the reversal of the top U.S. nutrition advisory panel’s position on cholesterol. This new Dietary Guidelines Advisory Committee finding, he notes, is long overdue, and is based on solid research showing that dietary factors such as butter, eggs, and meat do not increase risk of cardiovascular disease. Homeopath Cilla Whatcott, H.D., R.Hom., offers a viable option for those looking for nontoxic alternatives to vaccines—homeoprophylaxis, or homeopathic inoculation to stimulate the immune response. Michael E. Platt, M.D., warns that the underlying cause of many illnesses could very well be excess adrenaline in the body. He suggests that many conditions can be eliminated without the use of toxic medications and offers nutritional and bio-identical hormonal solutions to help stop the cycle of adrenaline dominance. Alvin Danenberg, D.D.S., points out that our skin plays a role in making vitamin D3 for the body in response to UBV, but that most people in the northern hemisphere do not get enough sun exposure. The risk of periodontal disease decreases, he explains, when there is adequate vitamin D3 intake. Jennice Vilhauer, Ph.D., tells Mary’s story to illustrate how our thinking processes can make us unhappy, and how choosing to think forward can help us create a more positive future. Shannon McRae, Ph.D., in two cases stories, demonstrates how the use of intuition in the practice of counseling can help discover disease conditions and guide others to effective healing. Each case involves the use of energy medicine and complementary nutritional support, and one highlights the power of self-forgiveness and self-love in reversing a severe illness. Can the Vaccinated Spread Viruses? Sugar or Salt as a Cause of High Blood Pressure?